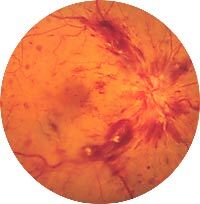 Retinal vein occlusion occurs when the circulation of a retinal vein becomes obstructed by an adjacent blood vessel, causing hemorrhages in the retina. 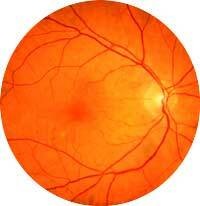 Swelling and ischemia (lack of oxygen) of the retina as well as glaucoma are fairly common complications. The visual symptoms can vary in severity from one person to the next, and are dependent on whether the central retinal vein or a branch retinal vein is involved. Patients who experience a branch vein occlusion often notice a gradual improvement in their vision as the hemorrhage resolves. Recovery from a central vein occlusion is much less likely. Vein occlusion is diagnosed by examining the retina with an ophthalmoscope. Fluorescein angiography may be performed in some cases to study the circulation of the retina and to determine the extent of macular edema or swelling.